There were many changes brought on by Hollywood Wildcats FC Board of Directors in our constant yearning to improve,this page, however, is dedicated to those changes that are not decided by the Club, but mandated to us by the Federation and State Association. There will be no headers allowed in small sided games. Also, there will be no headers in practice until players are 11 years old. There will be a limited number of headers in practice for ages U11 thru U14. Common sense should be applied by all coaches, remembering that these age brackets will be learning how to head the ball for the first time. When a player deliberately heads the ball in a game, an indirect free kick will be awarded to the opposing team from the spot of the offense. If the deliberate header occurs within the goalkeeper area, the indirect free kick should be taken on the goalkeeper area line parallel to the goal line at the point nearest to where the infringement occurred. If a player does not deliberately head the ball, then play should continue. Determination on whether a header was deliberate or not will be at the sole discretion of the referee. In conjunction with the US Soccer Federation and US Youth Soccer, the Florida Youth Soccer Association (FYSA) will be instituting a heading ban for players age 10 and younger. In accordance with the recent U.S. Soccer recommendations on concussion risk management. FYSA has eliminated heading in all small sided matches. Heading will not be permitted in 12u and younger age groups. Heading is only allowed in full sided 11v11 games and only by players at least 11 years of age. If a player is rostered to a U13 or older team (even if he/she does not participate) coach and player could be suspended for the remainder of that year and next whole year, BEWARE!!! You'll be seeing new field sizes and new goal sizes this year all over South Florida (and US), some will be wrong at first due to space constraints and budgetary issues (new set of goals can cost as much as $3500) please understand that the Clubs are doing the best they can with very late mandates from the Federation. Anything less than 11-a-side is considered a Small-Sided Game. What are the differences between Small-Sided Games and 11 v. 11 matches in regards to field size, goal size, etc.? The fields are smaller, as are the goals and the ball. The length of the game is also shorter. The rules to play the game are modified for each age group. What are the benefits to Small-Sided Games for players? With fewer players on the field and a smaller field on which to play the game the kids are more directly involved in the action of the game. That equates to more enjoyment in playing, more contact with the ball, more tactical decisions made and executed and more physical movement, which improves the player’s physical fitness. Is this something clubs in the United States already participate in? Many clubs, especially those affiliated with US Youth Soccer, have been playing Small-Sided Games in one version or another for years, perhaps even a decade or more. Are Small-Sided Games a fixture in other countries like Brazil, Germany, Spain? While Small-Sided Games are not new to American soccer, many other countries around the world also play Small-Sided Games with young players. In fact, Spain plays Small-Sided Games up through the U-15 age group. What are U.S. Soccer and US Youth Soccer doing to help coaches organize Small-Sided Games? Assistance is given to coaches through coaching courses and clinics given by the State Associations and the two national organizations. Where can I find more information on Small-Sided Games? Anyone interested in learning more about Small-Sided Games should use the Small-Sided Games Resource Center in the Coaches section of the US Youth Soccer website. What is “birth year registration”? Until 2016/2017, soccer programs registered players in groups or teams in line with school year registration, which meant that players born between August and July of the following year are grouped together. For example, players born between August 1st 2005 and July 31st 2006 were classified as “U10” (meaning players under 10). “Birth year registration” means that players are grouped together according to which year they are born in. For example, all players born between January 1st 2006 and December 31st 2006 would be grouped together and would be called “2006s”, “06s”, or now that it is in place for this soccer year (2017/18), “U12s” as all players would be turning 12 in the year in which the season finishes (2018). Most likely instead of U12 we will switch to 12U designation (meaning players 12 and under). Why? Who made this decision? Are other clubs doing it? 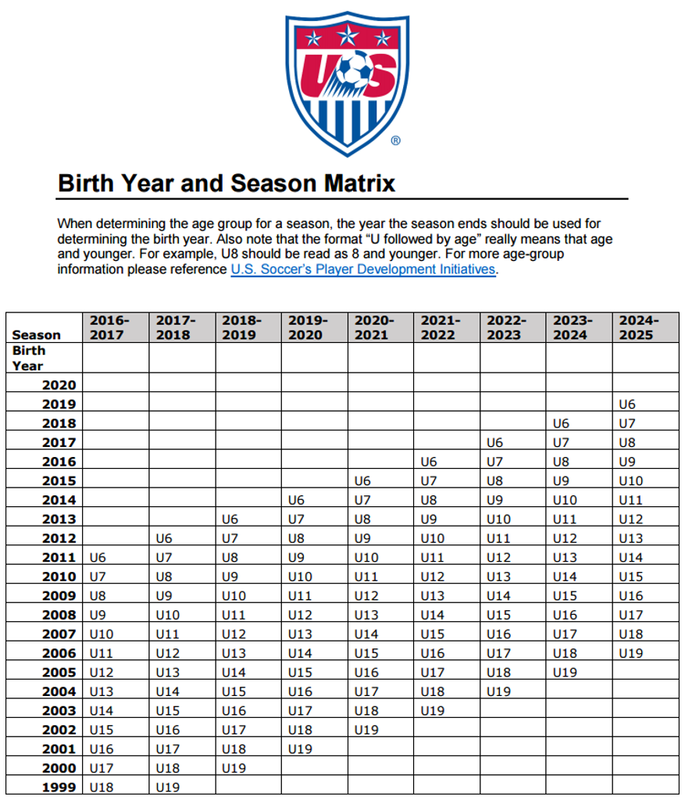 The decision to change to birth year registration was, in fact, a mandate from US Youth Soccer (USYS) and the U.S. Soccer Federation (USSF), along with other youth soccer sanctioning bodies, and so this change in registration applies to every club in the entire U.S.A. who register players through USYS. For example, any club or team which plays in the South Florida United League (SFUYSA), or tournaments such as Commissioner's Cup, President's Cup or State Cup are registered with and sanctioned by the Florida Youth Soccer Association (FYSA), which is an affiliate of, and ultimately governed by USYS. The answer to this depends on a variety of factors, including but not limited to: which level of program they are in (recreational or competitive); their skill level relative to their friends; their commitment level in terms of time, other sports/activities they take part in, how high a priority soccer is in their lives relative to their friends. All of these factors exist already, and so playing on a team with all of your friends isn’t always a reality in the current environment anyway. This is similar to not having all of your friends in the same class or classes at school. The placement of individual players on specific teams will remain a function of the club, whose job it is to help find each player the best possible environment to both maximize their individual development as well as to grow their love of the game as well as team sports and a healthy lifestyle in general. Doesn’t U.S. Soccer realize that they’re breaking up my existing team? U.S. Soccer recognizes that making these changes can impact existing teams in the short-term. However, players joining and leaving teams is something that already happens regularly throughout the country. There are a variety of factors that require teams to evolve and adapt including players’ maturity rates, moving away, focusing on new interests, or their soccer abilities differentiating from their peers. Again, both the small sided standards and birth year registration support the development of the individual player as a priority over a team success. Can existing teams continue to be registered together? Again, the answer to this depends on a number of factors. The short answer is that players will have the ability to “play up” with older teammates, so in theory teams would be able to stay together if that was best for each individual player’s development and the majority of the players on the team (for more detail on this, please see the section “How will the club make the decision if our team can stay together?” below). Players have the ability to “play up” with teammates at older age groups, based on birth year. Players are not permitted to “play down” with teammates at younger age groups, based on birth year. This rule is already in effect with the current registration method. Playing up will be limited at certain ages due to the recent "NO HEADING" lawsuit settlement, more about that later. Having players train and play according to their age and developmental stage supports the objectives of the small sided standards announced by U.S. Soccer by focusing on the physiological and developmental needs of the player. This change is meant to better safeguard the development of youth players at all ages and levels. For more information on USYS’ small sided standards please click here. Will recreational programs use the birth year calendar registration? There is no universal definition of what separates recreational from competitive soccer. In addition to supporting the overall objectives of player development, U.S. Soccer believes that having separate registration systems based on undefined levels of play would create unnecessary confusion, and this would not provide a consistent approach across the soccer landscape. Players should also be provided the opportunity to develop to best of their abilities regardless of the level of play they are participating in. What is “relative age effect”? Relative age effect refers to the selection bias often shown towards players born in the earlier months in any age grouping method. For example, under the former school year registration system, a player born on August 1st 2005 may have a physical, mental or technical advantage over a player born on July 31st 2006 due to being up to 364 days older. How does this change fix “relative age effect”? Birth year registration is not intended or expected to eliminate relative age effect. However, having players grouped by birth year does make it easier to understand for parents and coaches as registering players according to birth year will help everyone understand and better identify the potential for bias. Birth year registration should be based on the year in which the season ends. For example, if a season begins in the fall of 2017 and ends in the summer of 2018 (ex: 2017-18 season), the players would be registered based on their age in the year 2018. To simplify determining the age group, just subtract the birth year from the year the season ends. Please refer to the Birth Year and Season Matrix at the bottom of this page for more detailed information. The support and the education of parents are key. Unless we do this together, we won’t be successful. U.S. Soccer acknowledges that these changes are not as easy as flipping a switch. Change of this magnitude takes time and it can be uncomfortable. Because of this, U.S. Soccer asks that the entire soccer community please have patience as these changes are implemented, and trust that these and future initiatives will lead to long-term success in the area of player development, which will ultimately lead to better-developed players and a bigger, more talented player pool for the highest levels of soccer in the U.S.A., including our homegrown MLS players and our Women’s and Men’s National Teams. It’s important to communicate with your local soccer leaders to avoid misinformation about these initiatives and their objectives. This includes speaking with your coach, club or league administrators, the contact details for whom you can find below. If you have additional questions that are not covered in this FAQ document, please feel free to email us at info@hollywoodwildcats.com or even contact U.S. Soccer at coaches@ussoccer.org.